Lazar Moiseyevich Kaganovich (Russian: Ла́зарь Моисе́евич Кагано́вич) (November 22, 1893 - July 25, 1991) was a Soviet politician and administrator and a close associate of Joseph Stalin. Kaganovich was one of Stalin's most loyal associates, who rose to become a member of the Politburo and the Presidium of the CPSU. As a trusted lieutenant, Stalin used Kaganovich to implement some of his more inhuman and catastrophic policies, such as collectivization and the rapid industrialization of the 1930s. The latter succeeded in creating heavy industry and making the Soviet Union into a world power, while collectivization largely failed to solve Soviet agricultural needs and met with strong resistance from the Russian peasantry. One area of such resistance was in the agriculturally rich Ukraine, once known as the breadbasket of Europe. Kaganovich played a role in enforcing the policies that led to the Holodomor, or Ukrainian famine, which resulted from Stalin's attempts to force Ukraine under Soviet control. The result was the genocide of as many as six million Ukrainians who resisted the imposition of Soviet control. For his role in zealously prosecuting Stalin's policies in the Holodomor and Great Purges, Kaganovich received the moniker, "Iron Lazar." After the death of Stalin, he joined with other hard-liners in an attempted coup against Nikita Krushchev. This Anti-Party Group included fellow hard-line Stalinists Vyacheslav Molotov, Kliment Voroshilov, and Georgy Malenkov. Kaganovich was removed from his posts and later expelled from the Communist Party. Kaganovich was born in 1893, to Jewish parents in the village of Kabany, Radomyshl uyezd, Kiev Gubernia, Russian Empire (now in Ukraine). Early in his political career, in 1915, Kaganovich worked as a Communist organizer in a shoe factory. This served as the basis for the claim that Kaganovich never received a formal education, and worked in a shoe factory, or as cobbler and shoemaker. Kaganovich was the son of a cattle dealer, and both he and his brother, Mikhail, attended Gymnasia. In 1911, he joined the Bolshevik party (following his older brother Mikhail Kaganovich who was already a member). Later in 1915, Kaganovich was arrested and sent back to Kabany. In March-April 1917, he was the Chairman of the Tanners Union and the vice-chairman of the Yuzovka Soviet. In May 1917, he became the leader of the military organization of Bolsheviks in Saratov, and in August 1917, he became the leader of the Polessky Committee of the Bolshevik party in Belarus. During the October Revolution, he was the leader of the revolt in Gomel. In 1918, Kaganovich acted as Commissar of the propaganda department of the Red Army. From May 1918 to August 1919, he was the Chairman of the Ispolkom of the Nizhny Novgorod gubernia. In 1919-1920, he was leader of the Voronezh gubernia. From 1920-22, he was in Turkmenistan, where he was one of the leaders of the Bolshevik struggle against local Muslim rebels (basmachi) and also led the following punitive expeditions against the local opposition. In May 1922, Stalin became the General Secretary of the Communist Party and immediately transferred Kaganovich to his apparatus to head the Organizational Department or Orgburo of the Secretariat. This department was responsible for all assignments within the apparatus of the Communist Party. Working there, Kaganovich helped to place Stalin's supporters in key positions within the Communist Party bureaucracy. In this position, he was noted for his high work capacity, personal loyalty to Stalin, and the total lack of his own opinions. He publicly stated that he would execute absolutely any order from Stalin, which at that time was a novelty. In 1924, Kaganovich became a member of the Central Committee. From 1925-28, Kaganovich was the First Secretary of the Communist Party of the Ukrainian SSR. In Ukraine, he was noted for his rigid policy of economic suppression of the kulaks (wealthier peasants) and his staunch opposition to the more moderate policy of Nikolai Bukharin who argued in favor of the "peaceful integration of kulaks into socialism." During his tenure as the leader of the Ukrainian SSR, the policy of Ukrainization was changed to Russification and many communist officials were purged as "Ukrainian Nationalists." In 1928, due to numerous protests against Kaganovich's leadership, Stalin was forced to transfer Kaganovich from Ukraine to Moscow, where he returned to his role as a Secretary of the Central Committee of the Communist Party, a position he held until 1939. As Secretary, he supported Stalin in his struggle against the so-called Left and Right Oppositions within the Communist Party, in the hope that Stalin would become the sole leader of the country. In 1933-34, he was the Chairman of the Commission for the Vetting of the Party Membership (Tsentralnaya komissiya po proverke partiynykh ryadov) and personally ensured that nobody connected with the anti-Stalin opposition would be permitted to remain a Communist Party member. In 1934, at the XXVII Congress of the Communist Party, Kaganovich was the chairman of the Counting Committee. He falsified voting for positions in the Central Committee, removing 290 votes opposing the Stalin candidacy. His actions led to Stalin's being re-elected as the General Secretary instead of Sergey Kirov. By the rules, the candidate receiving fewer opposing votes should become the General Secretary. Before Kaganovich's falsification, Stalin received 292 opposing votes and Kirov only three. However, the "official" result (due to the interference of Kaganovich) was that Stalin ended up with just two opposing votes. In 1930, Kaganovich became a member of the Soviet Politburo and the First Secretary of the Moscow Obkom of the Communist Party (1930-35) and Moscow Gorkom of the Communist Party (1931-34). He also supervised the implementation of many of Stalin's economic policies, including the collectivization of agriculture and rapid industrialization. In the 1930s, Kaganovich organized and greatly contributed to the building of the first Soviet underground rapid transport system, the Moscow Metro, which was named after him until 1955. During this period, he also oversaw the destruction of many of the city's oldest monuments including the Cathedral of Christ the Savior. In 1932, he led the ruthless suppression of the workers' strike in Ivanovo-Voznesensk. Kaganovich was one of the key figures in the Holodomor, or Ukrainian famine that was one of the largest national catastrophes of the Ukrainian nation in modern history, with direct loss of human life in the range of millions (estimates vary). While the famine in Ukraine was a part of a wider famine that also affected other regions of the USSR, the term Holodomor is specifically applied to the events that took place in territories populated by ethnic Ukrainians. Most modern scholars agree that the famine was caused by the policies of the government of the Soviet Union under Joseph Stalin, rather than by natural reasons, and the Holodomor is sometimes referred to as the Ukrainian Genocide, arguing that the Holodomor was engineered by the Soviets, specifically targeting the Ukrainian people to destroy the Ukrainian nation as a political factor and social entity. Whether it was genocide or merely an attempt to force the Ukrainian leaders to "knuckle under" to Stalin's control, the brutality of the Soviet repression of Ukraine is not a matter of dispute. Kaganovich (together with Vyacheslav Molotov) took part in the All-Ukrainian Party Conference of 1930 and actively encouraged the policies of collectivization that according to many historians led to the catastrophic 1932-33 Ukrainian famine (the Holodomor), in which millions of Ukrainians died. Similar policies also inflicted enormous suffering on the Soviet Central Asian republic of Kazakhstan, the Kuban region, Crimea, the lower Volga region, and other parts of the Soviet Union. As an emissary of the Central Committee of the Communist Party, Kaganovich traveled to Ukraine, the Central region of Russia, the Northern Caucasus, and Siberia demanding the acceleration of collectivization and repressions against the kulaks, who were generally used as scapegoats for the slow progress of collectivization, and their supporters. Robert Conquest named Kaganovich together with Molotov, Pavel Postyshev, and other Stalinist leaders of the USSR as having personal responsibility for the artificial famine. From 1935-37, Kaganovich worked as Narkom (minister) for the railroads. Even before the start of the Great Purges, he organized the arrests of thousands of railroad administrators and managers as supposed "saboteurs." From 1937-39, Kaganovich served as Narkom for Heavy Industry. In 1939–40, he served as Narkom for the Oil Industry. Each of his assignments was connected with arrests in order to improve discipline and compliance with Stalin's policies. In all Party conferences of the later 1930s, he made speeches demanding increased efforts in the search for and persecution of "foreign spies" and "saboteurs." For his ruthlessness in the execution of Stalin's orders, he was given the nickname "Iron Lazar." One of many who perished during these years was Lazar's brother, Narkom of the Aviation Industry Mikhail Kaganovich. On January 10, 1940, Mikhail was demoted to director of the aviation plant "N24" in Kazan. In February 1941, during the 18th Conference of the Communist Party, Mikhail was warned that if the plant missed its deadlines he would be ejected from the Party. On June 1, 1941, Stalin mentioned to Lazar that he had heard that Mikhail was "associating with the right wing." Lazar reportedly did not speak in the defense of his brother to Stalin, but did notify him by telephone. The same day Mikhail committed suicide. 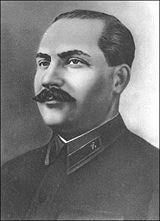 During the Great Patriotic War, Kaganovich held the position of the Commissar (Member of the Military Council) of the North Caucasian and Transcaucasian Fronts. In 1943–44, he was again the Narkom for the railroads. In 1943, he was presented with the title of the Hero of Socialist Labor. From 1944-47, Kaganovich was the Minister for Building Materials. In 1947, he became the First Secretary of the Ukrainian Communist Party. During 1948 to 1952, he served as the Chief of Gossnab, and from 1952 to 1957, as the First Vice-Premier of the Council of Ministries. Kaganovich was, until 1957, a full member of the Politburo as well as the Presidium. He was also an early mentor of eventual First Secretary of the Communist Party Nikita Khrushchev, who first rose to prominence as Kaganovich's Moscow City deputy in the 1930s. In 1947, when Khrushchev was stripped of the Party leadership in Ukraine (he remained in the somewhat lesser "head of government" position), Stalin dispatched Kaganovich to replace him until Khrushshev was reinstated later that year. Kaganovich was a rigid Stalinist, and though he remained a member of the Presidium, quickly lost influence after Stalin's death in March 1953. In 1957, along with fellow hard-line Stalinists Vyacheslav Molotov, Kliment Voroshilov, and Georgy Malenkov (the so-called Anti-Party Group), he participated in an abortive party coup against his former protégé Khrushchev, who had over the preceding two years become increasingly harsh in his criticism of Stalin. As a result of the unsuccessful coup, Kaganovich was forced to retire from the Presidium and the Central Committee, and was given the position of director of a small Ural potassium factory. In 1961, Kaganovitch was completely expelled from the party and became a pensioner living in Moscow. His grandchildren reported that following his dismissal from the Central Committee, Kaganovich who had a reputation for his temperamental and allegedly violent nature, never again shouted and became a devoted grandfather. Kaganovich survived to the age of 97, dying just before the events that led to the final unraveling of the Soviet Union in 1991. He is buried in the famed Novodevichy Cemetery in Moscow. In 1987, American journalist Stuart Kahan published a book entitled The Wolf of the Kremlin: The First Biography of L.M. Kaganovich, the Soviet Union's Architect of Fear (William Morrow & Co). In the book, Kahan made a series of claims about Kaganovich's working relationship with Joseph Stalin and his activities during the Ukrainian famine, and claimed to be the long-lost nephew of Kaganovich. He also claimed to have interviewed Kaganovich personally and stated that Kaganovich admitted to being partially responsible for the death of Stalin in 1953 (supposedly via poisoning). A number of other unusual claims were made as well, including that Stalin was married to Kaganovich's sister in the last year of his life and that Kaganovich (a Jew) was the architect of anti-Jewish pogroms. It should be noted that the book is filled with political, historical and biographical errors when compared to Kaganovich's own memoirs which were published in Russian in 1996. After The Wolf of the Kremlin was translated into the Russian language by Progress Publishers, and a chapter from it printed in the Nedelya (Week) newspaper in 1991, remaining members of Kaganovich's family penned the Statement of the Kaganovich Family in response. The statement disputed all of Kahan's claims and provided evidence that brought into question all of Kahan's factual assertions. In 1944, the newly-launched light cruiser of the project 26-bis was named after Lazar Kaganovich. It entered the Soviet Pacific Fleet in December 1944. According to TIME Magazine and some newspapers, Lazar Kaganovich's son, Mikhail (named after Lazar's late brother) married Svetlana Dzhugashvili, daughter of Joseph Stalin on July 3, 1951. Svetlana in her memoirs denies even the existence of such a son. ↑ Edvard Radzinsky, Stalin (Doubleday, 1996, ISBN 0385479549). ↑ Edward Afron Rees, Stalinism and Soviet Rail Transport, 1928-41 (Birmingham: Palgrave Macmillan, 1944), 111. ↑ U.S. Commission on the Ukraine Famine, "Findings of the Commission on the Ukraine Famine," Report to Congress, Washington, D.C., April 19, 1988. Retrieved December 28, 2008. ↑ Renaissance Research, December 01, 2008, UKRAINIAN GENOCIDE MEMORIAL GROUNDBREAKING CEREMONY IN WASHINGTON, D.C. Retrieved December 28, 2008. ↑ Skrobach, Statement by Pope John Paul II on the 70th anniversary of the Famine. Retrieved January 20, 2009. ↑ Art Ukraine, HR356 Expressing the sense of the House of Representatives regarding the man-made famine that occurred in Ukraine in 1932-1933, U.S. House of Representatives, Washington, D.C., October 21, 2003. Retrieved January 20, 2009. ↑ Yaroslav Bilinsky, Was the Ukrainian Famine of 1932-1933 Genocide? Journal of Genocide Research 1 (2) (1999): 147–156. Retrieved December 28, 2008. ↑ Robert Conquest, The Harvest of Sorrow: Soviet Collectivisation and the Terror-Famine (Oxford University Press, 1989, ISBN 0195051807). ↑ Stuart Kahan, The Wolf of the Kremlin: The First Biography of L.M. Kaganovich, the Soviet Union's Architect of Fear (William Morrow & Co, 1987). ↑ Revolutionary Democracy, Statement of the Kaganovich Family, Translated from the Russian by Igor Minervin. Retrieved December 28, 2008. ↑ Time, Social Notes. Retrieved December 16, 2008. Alliluyeva, Svetlana. Only one Year. Translated [from the Russian] by Paul Chavchavadze. London: Hutchinson, 1969. Conquest, Robert. The Harvest of Sorrow: Soviet Collectivisation and the Terror-Famine. Oxford University Press, 1989. ISBN 0195051807. Kahan, Stuart. The Wolf of the Kremlin: The First Biography of L.M. Kaganovich, the Soviet Union's Architect of Fear. William Morrow & Co, 1987. ISBN 9780688075293. Radzinsky, Edvard. Stalin. Doubleday, 1996. ISBN 0385479549. Rees, Edward Afron. 1994. Stalinism and Soviet Rail Transport, 1928-41. Birmingham: Palgrave Macmillan, 1995. ISBN 9780333524152. Revolutionary Democracy. Statement of the Kaganovich Family, Translated from the Russian by Igor Minervin. Retrieved December 28, 2008. This page was last modified on 26 July 2014, at 15:45.